CoreUM is a meeting scheduling app that allows users from different organizations to easily send meeting invites and coordinate on the best time for everyone. Designed for individuals who want to send invites for meeting to several people, CoreUM allows users to choose several dates, send those dates to users, and determine which works best for everyone. The idea of CoreUM came from work with non-profit organizations who often have many different board members who do not share a singular email. Coordinating individuals such as this can be difficult through traditional applications, and CoreUM aims to make this process streamlined and simple for all participants. Effective and easy to use. The meetings can be coordinated without a lot of back and forth contact. It saves time and frustration trying to coordinate multiple meeting attendees. 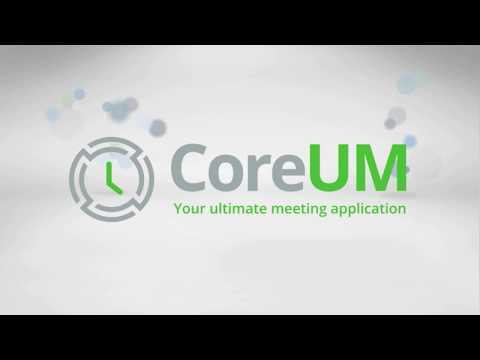 CoreUM makes it easy to coordinate meetings between numerous individuals. It is easy to use and the fact that it is web-based means access is no problem. I would not hesitate to recommend this product. CoreUM makes it easy to coordinate meetings between numerous individuals. It is easy to use and the fact that it is web-based means access is no problem. I would not hesitate to recommend this product. The product initially had some glitches with displaying notifications, but that has since been resolved. Frankly, it does what it is intended to do and I like that it doesn't try to be too many things to too many peolpe. Used to be difficult to coordinate large meetings with external participants - now it's a breeze! Saves time chasing people for meeting availabilityA much easier way to schedule appointments with external attendees. Easy to use. Intuitive interface. A much easier way to schedule appointments with external attendees. Easy to use. Intuitive interface. Would be great if the meeting invites came with Skype/Webex/Gotomeeting plugins. Maybe a mobile app version would be good. Integration with prem Exchange would be good too, but I understand that's a dying technology. Overall a good product with lots of potential but needs some added features to make it great. The software has been easy to use, is laid out very clearly and is simple for new users to use. I like it! I love the ease of sending to multiple members and the option to create different send to lists for our different committees. this is a great feature. the fact there is no option just to create a meeting (you need to send out meeting then "lock in date" this send multiple emails - when i already know the date and time i would like the ease of locking in immediately to reduce emails send to attendees. also not being able to change a date without removing the meeting and creating a new one. CoreUM has a free version, a VIP version ($29/year), and a Corporate version (pricing varies bases on number of organizers). Calendar integration - download and integrate your meeting time with traditional calendar apps. Time management features - includes timed reminders and mandatory answer-by dates. Quorum tracking - if quorum must be achieved (i.e. board meetings), the option can be toggled to ensure all decision makers are present. Groups - choose between new or predetermined groups when choosing contacts. Resource management - add files such as documents, PDFs, images, etc. to share with invitees or poll participants. Below are some frequently asked questions for CoreUM. Q. What type of pricing plans does CoreUM offer? Q. Who are the typical users of CoreUM? Q. What languages does CoreUM support? Q. Does CoreUM support mobile devices? Q. Does CoreUM offer an API? No, CoreUM does not have an API available. Q. What other apps does CoreUM integrate with? Q. What level of support does CoreUM offer?